Stained glass is an art form that dates back thousands of years and can be found nearly everywhere, from Egyptian and Roman pottery to Medieval churches and mosques all over the world. 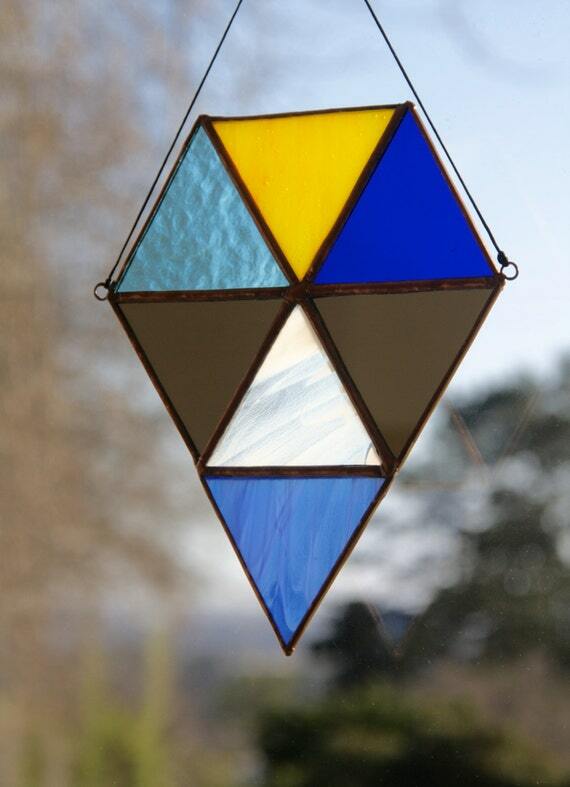 While stained glass windows traditionally adorn religious buildings and other important establishments, contemporary artists like Frank Lloyd Wright have demonstrated that they can also be used in homes. 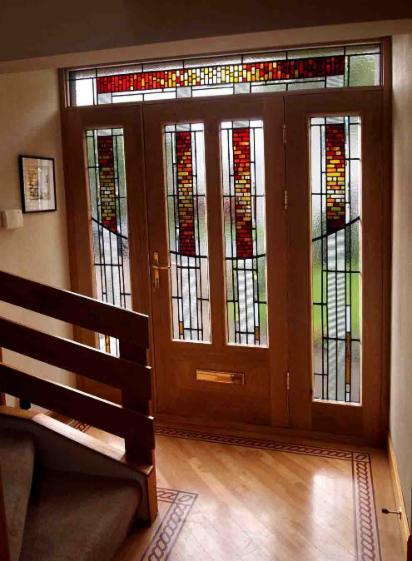 We love the juxtaposition of historical and modern design elements and think that stained glass windows are the perfect way to give a nod to tradition in your modern home. Here are just a few of our favorite stained glass window decorations to give you some inspiration. Even the smallest homes can have modern stained glass windows—or doors, in this case. We love the way the bright colors in this reclaimed door add light and character to this tiny house with a combination of geometric and modern panels. We’re sure the owner wouldn’t mind if we copied this design in our own home! While an art deco design like this is more early 20th century than ultra modern, many contemporary homeowners are embracing this kind of throwback style in entryways and other surprising places throughout the home. The bright primary hues in these windows add just the right touch of color while still allowing light to flood in through the clear glass. Stained glass was given its first, most popular taste of modernity with architect and designer Frank Lloyd Wright’s trademark linear style. We’re sure he wouldn’t mind if you copied this style in your own home with a combination of geometric patterns and golden tones. 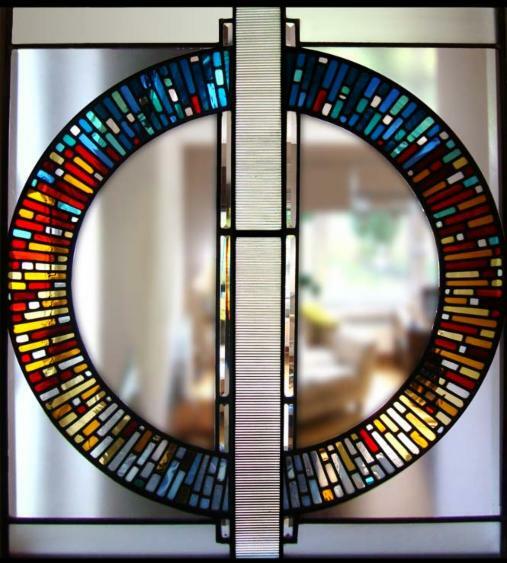 This impeccable stained glass door design would be right at home in a modern church, but everyone can agree that this contemporary take on a classic art form makes a stunning addition to the home—in this case, as an inner entryway that is more of an inviting conversation starter than a simple door. Some contemporary homes have small rosettes and other frilly stained glass designs in their entryways, but this particular design is certainly not one of them. Upgrade your entryway with a modern geometric print and give your home added curb appeal. Although this front door has tons of exposed glass, the stained glass designs give privacy while still allowing the light to shine through. 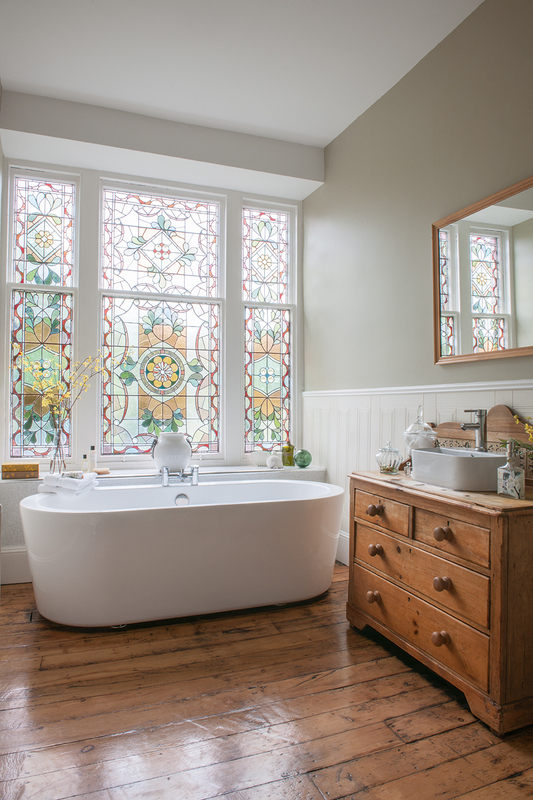 If your home is blessed with original European-style Victorian or Edwardian windows, there is no reason to get rid of them in order to make your home more contemporary. A quality restoration job can breathe new life into even the most tired stained glass windows and make them look as good as new. This bathroom is an excellent example of the ways in which traditional and modern styles can come together to create something breathtaking. When one stained glass window simply isn’t enough, there is no reason you can’t create an entire glass wall to showcase your favorite designs and colors. This stained glass wall is more art installation than functional window, but we love the way the light shines through and makes a unique and remarkable statement. Who wouldn’t want to work in a room like this? Stained glass is perhaps the perfect solution for homeowners who are looking for a way to make their homes unique. This mosaic style doorway is actually an artistic representation of all the Pantone colors used throughout this particular home and certainly makes a lasting impression. We love the modern interpretation of stained glass here and especially the way the light reflects onto the stairway. Homeowners who love the idea of stained glass but either can’t or don’t want to commit to new windows will love these affordable alternatives. Available from just about everywhere in a variety of design styles, these stained glass window hangings will add the same color and light as a window without the cost and disruption to the fabric of your home. If you’re feeling inspired by these designs and want to add some character and color to your home, there is no reason not to take the leap into the world of stained glass. The best thing about this kind of artistic expression is that there is no limit to the kinds of pieces you can have in your home, so let your mind run wild and get creating!